Rugby Australia is pressing ahead with plans to terminate Israel Folau's contract after the Wallabies full-back was served with a breach notice over his discriminatory social media posts. Folau has been deemed by the union's integrity unit to have committed a "high-level breach of the Professional Players' Code of Conduct", warranting the termination of his employment contract. The 30-year-old said on his Instagram and Twitter accounts last week that "hell awaits" for "drunks, homosexuals, adulterers, liars, fornicators, thieves, atheists, idolaters". Folau has 48 hours to accept the sanction or have the matter referred to a Code of Conduct hearing. Rugby Australia Chief Executive, Raelene Castle, said: "At its core, this is an issue of the responsibilities an employee owes to their employer and the commitments they make to their employer to abide by their employer's policies and procedures and adhere to their employer's values. "Following the events of last year, Israel was warned formally and repeatedly about the expectations of him as player for the Wallabies and NSW Waratahs with regards to social media use and he has failed to meet those obligations. "It was made clear to him that any social media posts or commentary that is in any way disrespectful to people because of their sexuality will result in disciplinary action. The move by Rugby Australia comes hours after Wallabies head coach Michael Cheika said he would not be able to select Folau in the wake of his comments. Cheika spoke to the media along with Daryl Gibson, who coaches Folau's Super Rugby team, the New South Wales Waratahs, and Michael Hooper who captains the Wallabies and Waratahs. 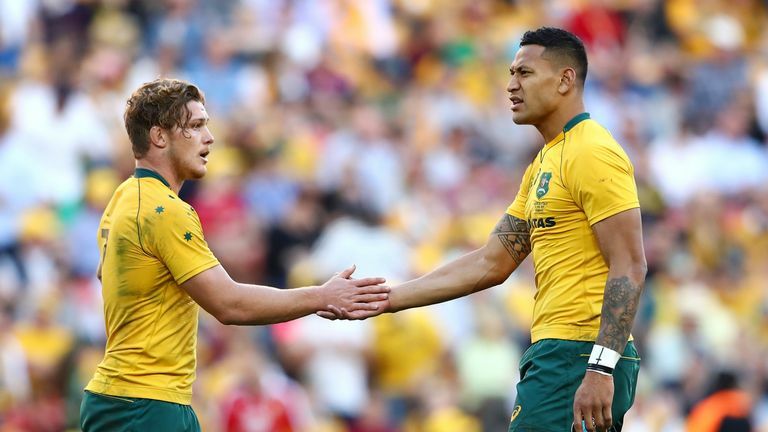 In 2017, Folau was warned by Rugby Australia after his use of social media to express opposition to gay marriage. Cheika said Folau's latest comments crossed a line. "We've had the discussion about it after the last time about his right to believe and our support in that," Cheika said. "But getting out in that disrespectful manner publicly is not what our team is about. "We've had the discussion about it and that line has then been crossed. When you play in the gold (Wallabies) jersey, we're representing everyone in Australia. Asked if Folau's post had made it hard to pick him for the Wallabies again, Cheika replied: "You wouldn't be able to." Hooper looked uncomfortable as he admitted he would find it difficult to play alongside Folau after his latest comments. "Like was said before, in this current state and being here and talking about this as a rugby player, it makes it hard, it makes it difficult," Hooper said. Folau gave an interview to The Sydney Morning Herald on Sunday after he had attended a church service in western Sydney in which he said it would be "God's will" if he didn't play rugby again. Folau said he had no intention of retracting or apologising for his comments about gay people which, he insisted were based on his Christian beliefs.